Shortly after 3 a.m. robins start to call in my neighbourhood. 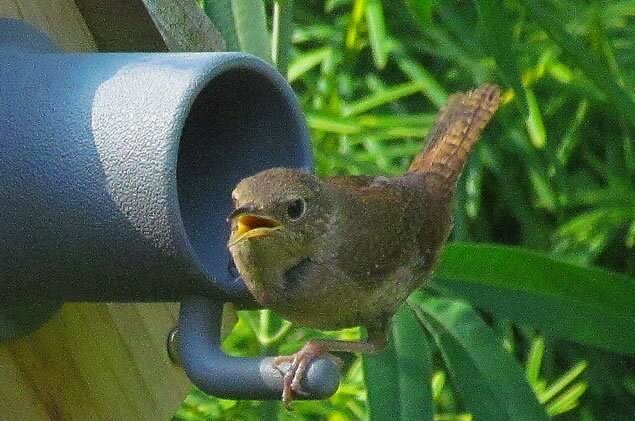 As dawn approaches other birds chime in – house wrens, chipping sparrows, cardinals, mourning doves and house finches. As the town awakens many of these birds continue to call, providing a melodious counterpoint to the whine of lawnmowers, leaf blowers and whipper snippers. Birds accent our world in other positive ways of course. Their colours please the eye, and their flight – soaring, gliding, swooping – stirs the imagination. 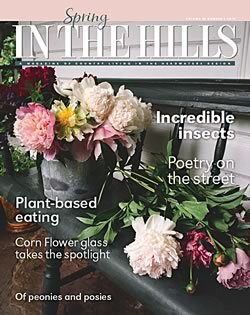 Even people who generally care not a whit about nature, like birds. We should ask then, what our birds need to survive. Food is a good place to start. 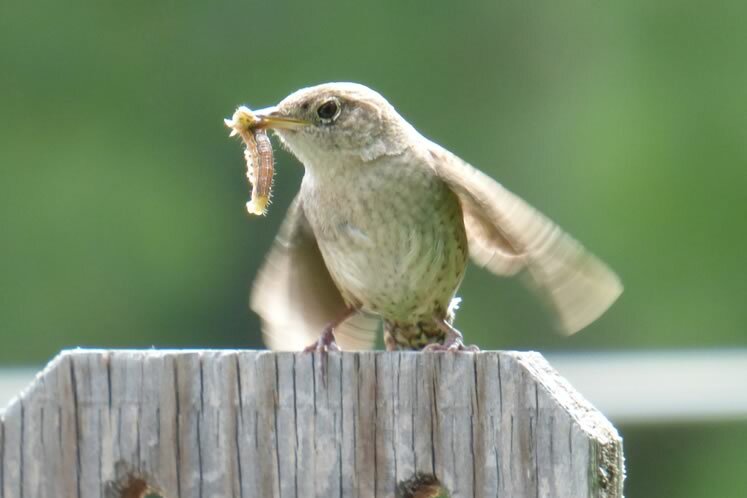 Birds, as I’ve written before, need bugs and lots of them. 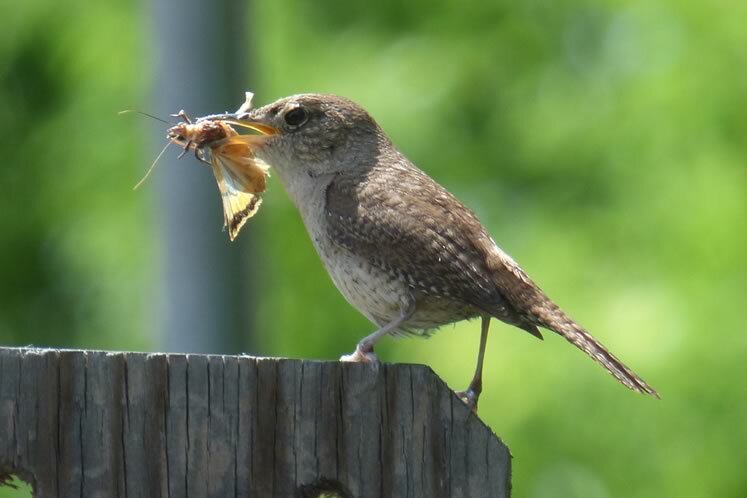 Even the nestlings of confirmed seed eaters like cardinals, need bug protein to build their developing bodies. Now I’m using “bugs” in the generic sense. What I really mean is invertebrates, which can include worms, spiders and all sorts of insects. 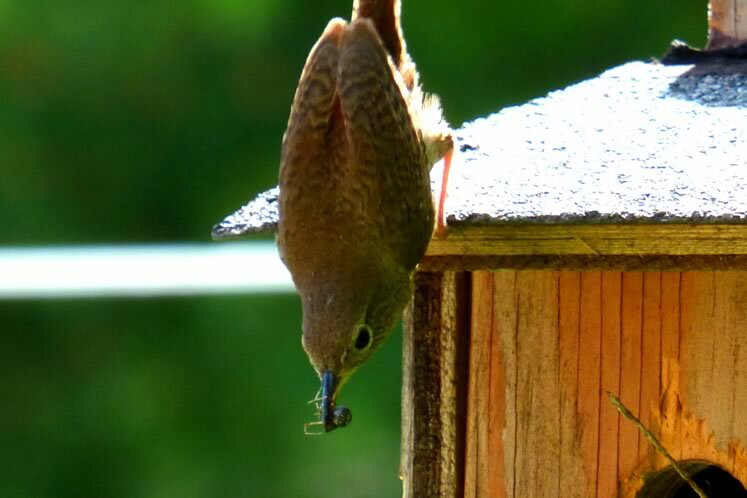 I recently had the pleasure of watching a pair of house wren parents feed their babies in a backyard nest box. The parents worked feverishly to collect spiders, centipedes, caterpillars, moths, and a host of other critters too small to identify. Their youngsters gobbled all and sundry with seeming relish. 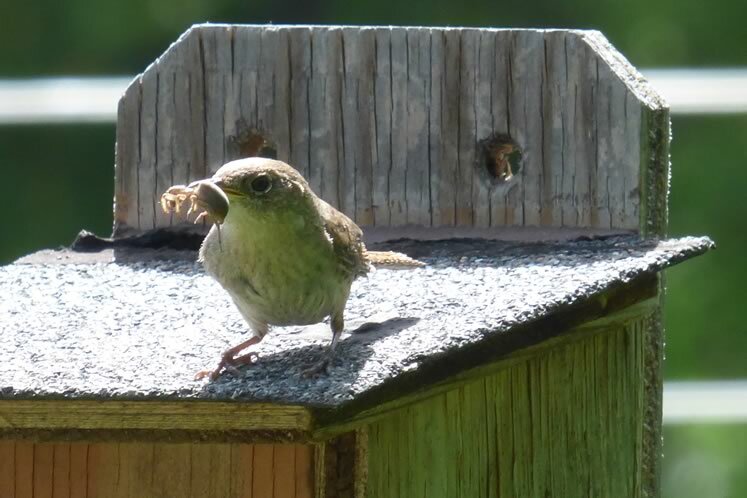 On average, as the nestlings neared fledgling stage, the harried parents delivered food every three minutes. 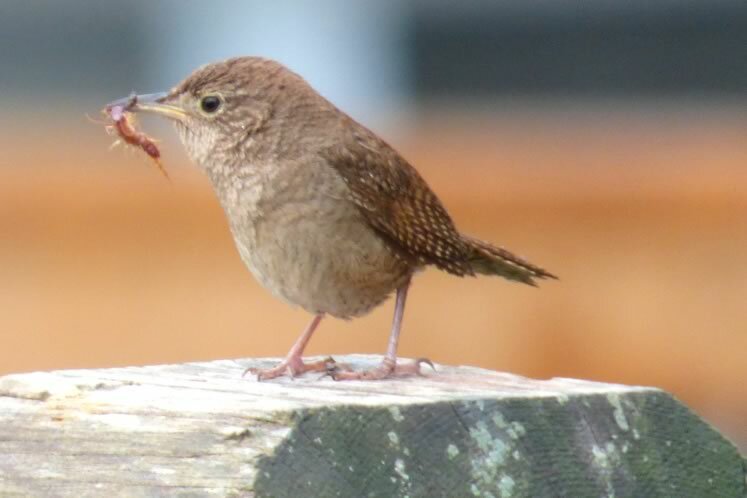 The wren parents worked feverishly to collect spiders, centipedes, caterpillars, moths, and a host of other critters. 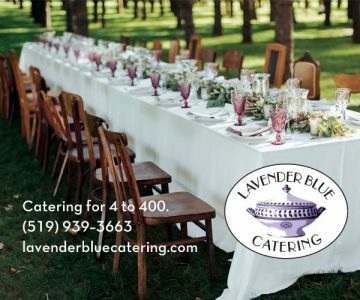 “Untidy” yards with brush piles in the corners, weeds in the lawn and exuberant, if slightly unkempt, vegetation will produce more bugs than those weed-whacked into submission. 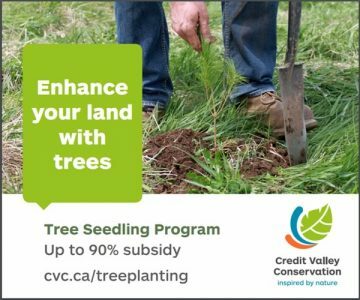 My naturalized yard will never grace the cover of Fine Gardening magazine. 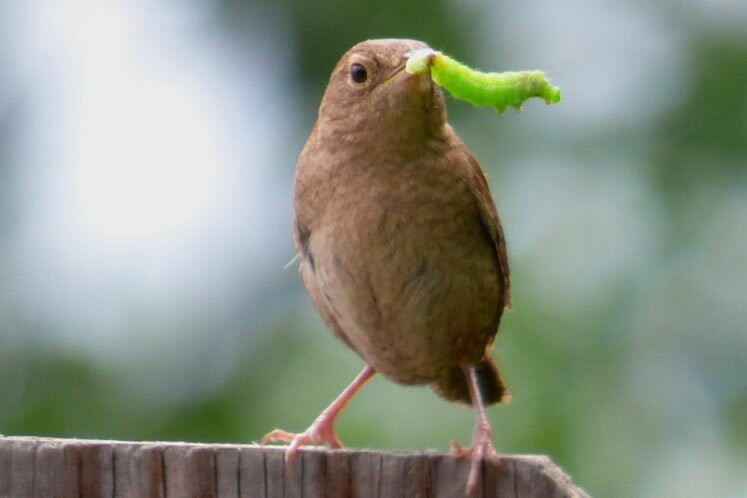 But that’s ok. Bugs like it, and those bugs power the beautiful songs of birds. 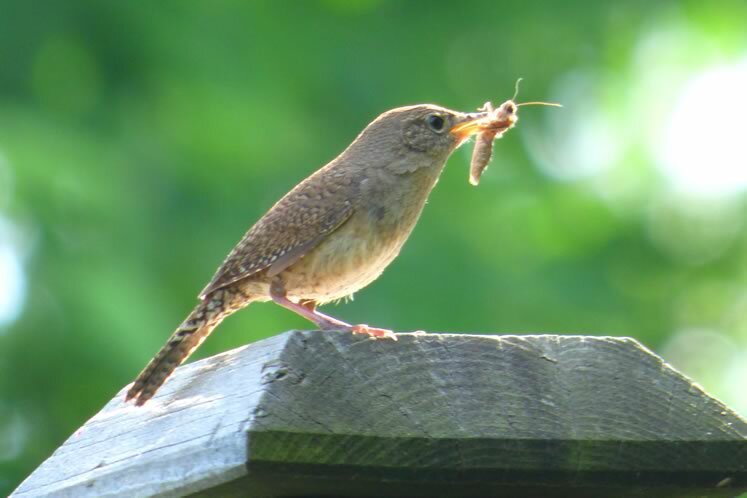 Both male and female wrens generate a potpourri of chatter – a profusion of messaging rivaling the texting of human teenagers. 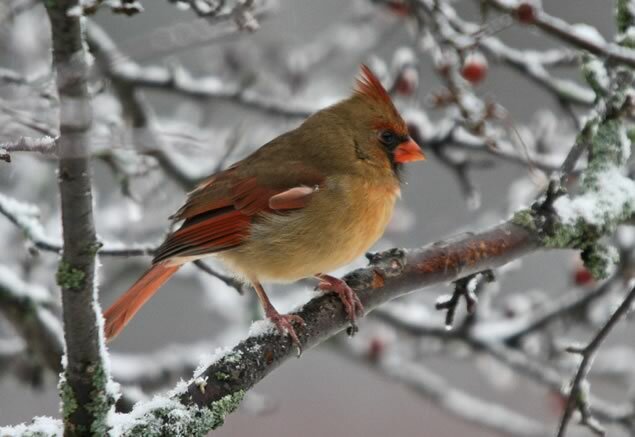 Cardinals appear at feeders most frequently at dusk and dawn. Perhaps during the twilight hours they are less visible to predators. 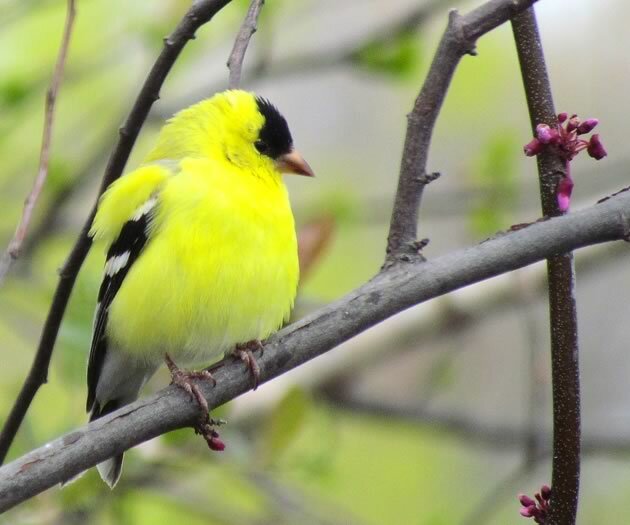 Don’t worry about deadheading your perennials after they flower – allow them to go to seed and provide succor to goldfinches and other birds. 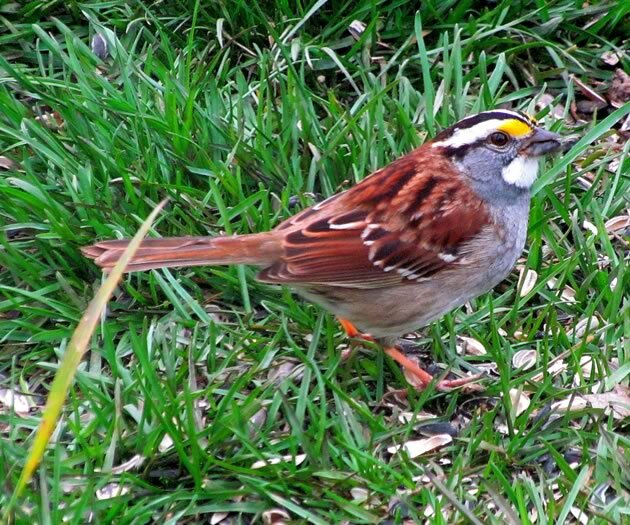 Take time to notice the fox, white-crowned and white-throated sparrows.